Quinoa? Check. Oats? Check. Spelt? Check! What more could you ask for? Extra-virgin coconut oil instead of butter and organic rapadura sugar instead of refined white sugar? You can tick those boxes too 'cos these cookies have it all. Now, I know I haven't been posting many cookie recipes in this blog in the past, but I just couldn't wait to share this recipe with you. 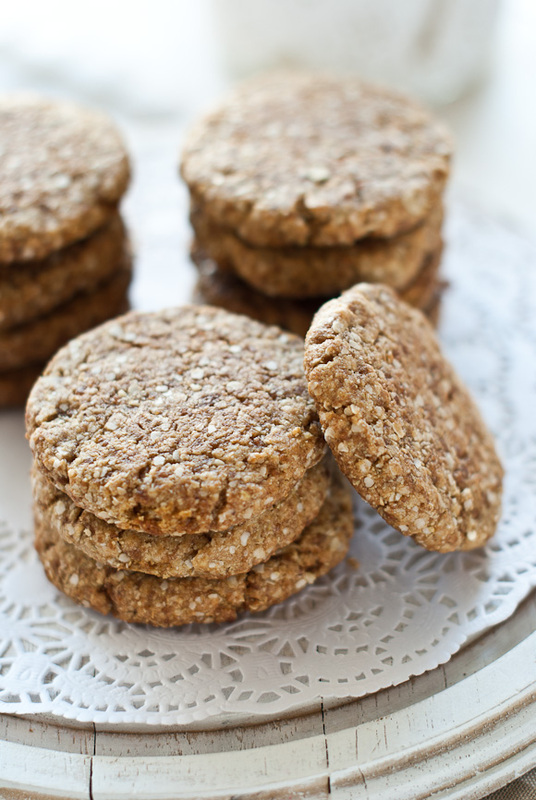 These are sweet and crunchy, but wholesome and guilt-free. I've got my weekend treat sorted! These will keep in an air-tight container for 2 to 3 days, if they'll last you that long. You could pass them on as a home-made gift too, but in that case I'd probably make a double batch - they are just too addictive. 1. Preheat oven to 180C and line a baking tray with baking paper. 2. Place the quinoa flakes and rolled oats in a food processor and blitz until the quite fine. 3. Place the quinoa, oats, spelt flour, baking powder and baking soda in a bowl and mix to combine. Set aside. 4. Beat the coconut oil and sugar in a separate bowl until light and fluffy (about 5 minutes). Add the dry ingredients into the mixture and gently knead the dough incorporating little bit of cold water in if necessary. Use just enough water for the dough to come together. I find this easiest to do by watering my hands, then kneading the dough. 5. Take small portions of the dough and shape them into disks. Place on a baking tray leaving a bit of space between each cookie. 6. Bake for 15-20 minutes or until firm to touch and golden brown. You may need to gently flip them over half way through to ensure even baking. 7. Cool on a wire rack, then store in an air-tight container. Maria, these look very delicious and are healthy too! Have a great weekend! oh my gosh, really? you need to open a bakery! Healthy cookies! Perfection! 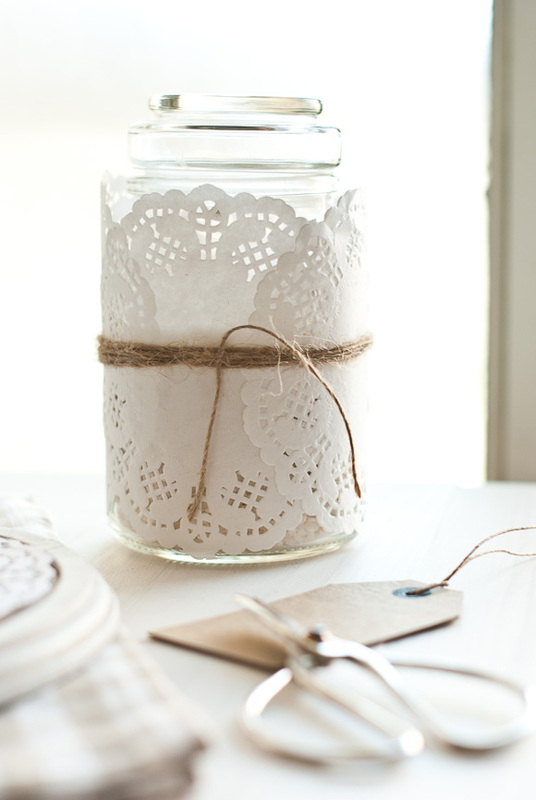 I love how you put the doilies around th ejar. very pretty! Yum! I have to try them. I haven't tried spelt yet, but it's on my list. I use organic raw sugar all the time, never have white sugar in the house. I also use organic extra virgin olive oil often in place of butter, love it. I don't like things very sweet so these sound perfect. Funny I posted a cookie today too (which I don't bake much either). Have a great weekend! I just discovered your blog and am really enjoying it! These cookies look divine. I can't resist anything with oats! I have quinoa flakes in my cupboard and have been wondering what else I can make with them, so thank you for sharing this recipe. Excellent cookies, absolutely love the ingredients used. they look amazing and when I saw these pics hit instagram, I was all over it! That's amazingly guilt free!! Can't believe it's so healthy! I've got all of the above..only in whole form, not flour. Wish I had my own mill! But they look delicious! very more-ish! I love how healthy they are! Thanks for sharing a gorgeous recipe! Lovely cookies! I love their rustic looks. I bet they are very flavorful and enjoyable. I happen to have a box of quinoa flakes in my pantry and I was just trying to come up with something to make, perfect timing! These look fantastic. 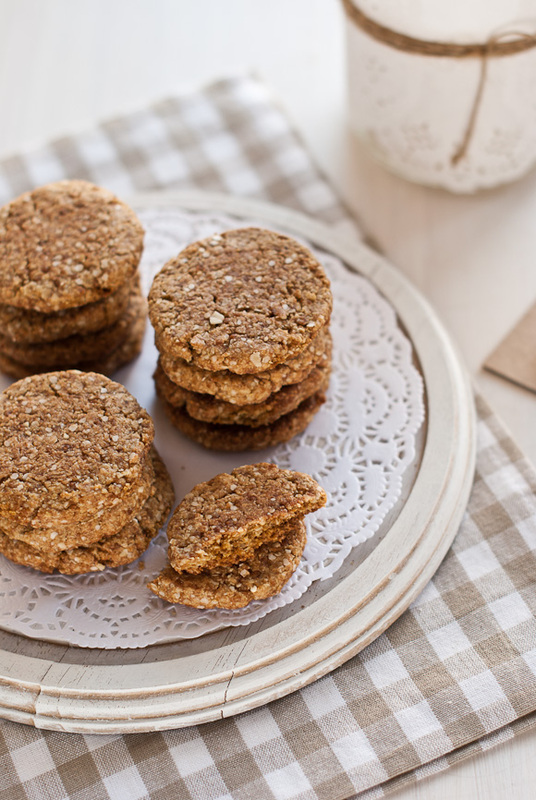 What beautiful looking, healthy cookies- I m in love with your pictures! Now this is what i need to learn .. making guilt free gorgeous cookies. 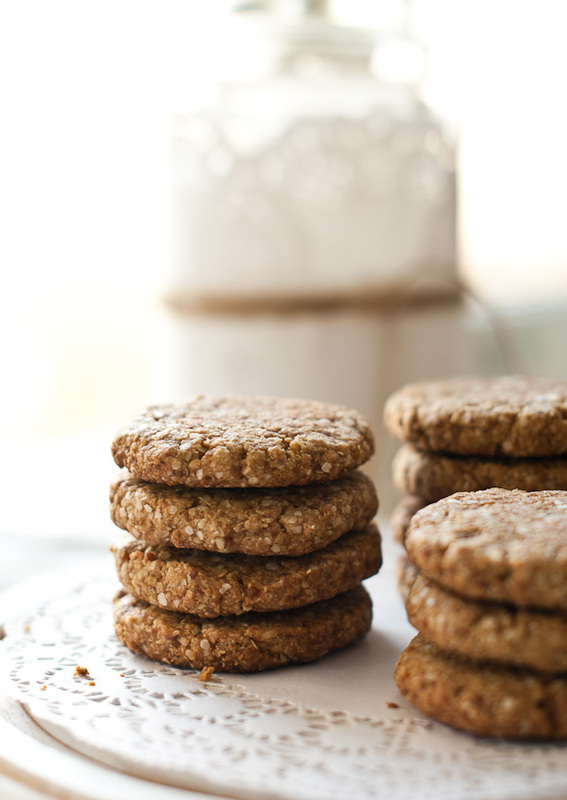 I never baked with spelt but now I am tempted! These look fabulous! I could maybe imagine them as the base for a layered cookie crumb - fruit - yoghurt type dessert too! Yum! Maria, I have to say you make some of the healthiest recipe in the food blogging community! Well done! These sound divine...enjoy your weekend. Nami,näitä pitää ehdottomasti kokeilla! Ja kiva uusi bannerikuva! Love these! They sound like the perfect cookie with all of those healthy ingredients. I love cookies like this! I can't wait to get more spelt flour to try them out. These cookies look gorgeous - I will definitely try them. What a great flavor combo! Those jars are absolutely adorable, too. Love it. what a beautiful way to store the cookies- and perfect for a gift for someone too!! 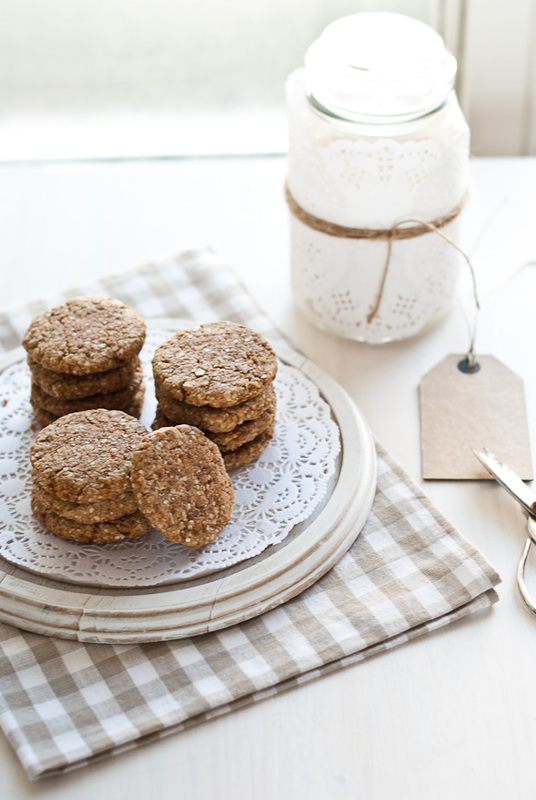 i love how you can see the texture of the cookies- and they definitely seem like they would not only be healthy but very delicious as well! Oh, Maria, I do remember something v like it from my childhood also, even tho' spelt, quinoa and coconut oil would not have been in the recipe! You ARE getting me back to baking again, 'cause 'the guilts' put a stop to the latter quite awhiles ago! Shall send this along as a Sat am present to quite a few! Thanks!! Maria they look wonderful. No guilt at all in chomping my way through them. I love that these are super wholesome yet also super delicious! So pure and healthy... is it wrong my first thoughts were to sandwich ice cream between two of them? Genius, Maria! Can't wait to try this! Wholesome and guilt-free cookies?? Why yes please!! Wonderful cookies, I love how healthy they are! Sulla on joka päivä toinen toistaan parempia ruokakuvia, jos mahdollista edes :) aivan ihanannäköisiä nämäkin! Well, I have never baked cookies (or anything for that matter) with these ingredients, so I am eager to check these out! These look right up my alley, although I have never found quinoa flakes before, but am happy I now have a reason to look for them. I love spelt flour too, so am looking forward to seeing how these work out! such pretty photos! and they look so good! love that they are healthy toooo! thanks for stopping by simple blueprint yesterday! hope you have a lovely weekend. p.s. your cookies are bookmarked! I just got around to making these yesterday. They were such a hit at an afternoon tea that I went to! Everyone loved them, the kids and the adults!! Thank you for inspiring me to make these beautiful and healthy things. Next time I'll make mine thicker like yours on the baking tray as they turned out a little flat. I also used coconut sugar as it is what I had on hand. I was surprised at how much water I needed to add for it to all come together, about a half a cup, but the dough was perfect in the end. Thank you again. I'm now onto the carrot muffins!! Stupid question. "Extra virgin coconut oil, not liquid". To those of use that are not well versed in coconut, what is this referring to? Thank you! Sorry, I should've been more specific. What I meant was coconut oil in its 'butter' form in room temperature. These were lovely and crunchy and suited my husband's low FODMAP diet requirements. I just replaced the coconut butter with margarine.and replaced some of the sugar with some maple syrup. WIll be a regular in our family's biscuit jar. Would coconut nectar work for the sugar? These look amazing and can't wait to make these! Thank you! I haven't used coconut nectar so I don't know how that would behave, sorry! You could always try replacing some of the sugar with that and even use coconut sugar for the other part. These look yummy, I will definitely be trying them!